Spoilers for Season 6, Episode 2 are all over this article. If you haven’t caught the episode, yet, please be sure to check out one of our other lovely articles. Update: if you read this and are wondering more about the Jon Snow situation, check out our reaction to the big Jon Snow reveal here. This week, during "Home," the scenes from last week prominently feature footage of Jon Snow lying dead on a slab, giving us a big hint that Jon Snow might come into play during Episode 2. As it turns out, there are a lot of scenes on The Wall this week, including one that features Jon Snow finally returning from the dead. Go ahead, heave a huge sigh of relief. Here’s what happened. Early on in the episode, Ser Davos and his small band of Jon Snow fans are protecting the body of the Lord Commander when the wildlings and some of the men of the Night’s Watch decide to get in on the action. After the giant kills a few of the men who opposed Jon Snow’s policies, the remaining men put down their arms and Allister and Olly are captured. Tormund goes to see Jon Snow’s body. After determining he’s dead, he and Ser Davos decide to ready a funeral pyre. As Tormund bluntly puts it, “bodies smell.” This would seem to be the end of the Jon Snow plotline if we didn’t know better. Ser Davos is actually the person who approaches Melisandre about bringing Jon Snow back, which I didn’t see coming at all. After episodes and episodes of the two characters not being on the same page about the future, Davos ultimately asks Melisandre if she has the skills to bring Jon Snow back. He tells her that he has no allegiance to any god, but implores her to prove to him that miracles do exist. There’s been some excellent scenes with the steadfast Ser Davos this season, and with this new Melisandre and Davos allegiance, I can’t wait to see what other antics will happen on The Wall during the coming weeks. But first, Jon Snow has to come back from the dead. Although Melisandre washes the body and performs some sort of spoken spell, cutting some of Jon Snow’s locks to use in the process, her efforts do not seem to have paid off… at least right away. Jon Snow still lies dead and cold on the slab and Melisandre looks truly sorrowful. An unsettled Tormund also seems to think the process has failed and leaves the room. Even Ghost is undisturbed, sleeping under the table. 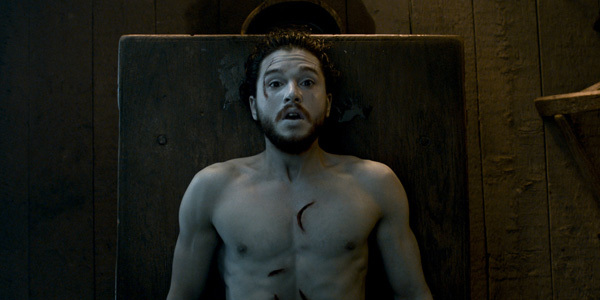 In the final moments of the episode, however, Ghost seems to awaken and we see Jon Snow breathe for the first time. Jon Snow’s death at the end of Season 5 was played off in a way that left his potential for survival a little open-ended. However, as actor Kit Harington was later seen near the Game of Thrones set, the HBO team eventually revealed that Jon Snow would be back—albeit as a corpse. Still, many fans thought a resurrection must be in the cards. Sure, Jon Snow was definitely dead on the series during Episode 1. He had been stabbed too many times and succumbed to his wounds. But as many fans suspected, that seems to have been a very temporary death for the Lord Commander of the Night’s Watch. When Melisandre speaks with Ser Davos during the episode, she reveals that bringing people back to the dead is a complex process with unpredictable results. Jon Snow has been dead on the slab for some time, and it’s difficult to tell what he will be like when he officially rises—especially as the HBO series cuts away before we have any idea what we are getting into with the newly revived version of the character. Luckily, Game of Thrones will be back on HBO next week at 9 p.m. ET. In the meantime, check out everything we know about the upcoming episodes.